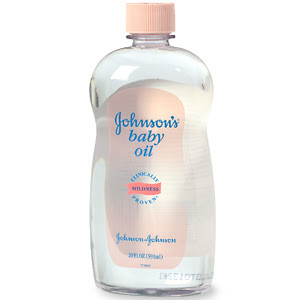 Johnson's Baby Oil has been an adult beauty staple for ages. We love to use it after shaving and waxing when the skin is very sensitive and also when we just need that extra shine on the legs when in those hot minis. Always keep this handy because babies are not the only ones who need gentle care. 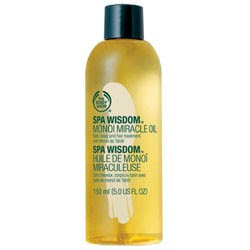 The Body Shop Spa Wisdom Monoi Miracle Oil is worth a try even though "Miracle" is overstating it a little bit. Made with Tahitian gardenia flowers and coconut oil, it can be used on hair, body and also as a bath oil. Parachute 100% Pure Coconut Oil can be used on the body and hair. It is also recommended by dermatologists for extra dry flaky skin. For rough feet and cracked heels, apply before going to bed and wear cotton socks. When skin is healthy, light reflects off the rich color below the surface, giving it an amazing, natural glow. But daily showers strip natural, protecting oils from skin allowing essential moisture to evaporate. Cocoa Butter Vitalizing Gel Body Oil, used after bathing, replenishes skin and locks in moisture for naturally radiant skin. Parachute really worked well for me during a winter when I suffered from extreme dryness..
Baby Oil however tends to give me pimples on the face. & applied on the arms/legs it makes me feel very hot (lol, I know, it sounds funny, but I feel very sweaty with it on.. ) besides it stains everything.. I've read that Baby Oil shouldn't be used on the face as it may clog pores and subsequently cause spots. However works brillantly on the bod! !